A work by Koller is also the inspiration for the second work presented at Centro Pecci, Untitled (Remember JK, Universal Futurological Question Mark U. F. O. 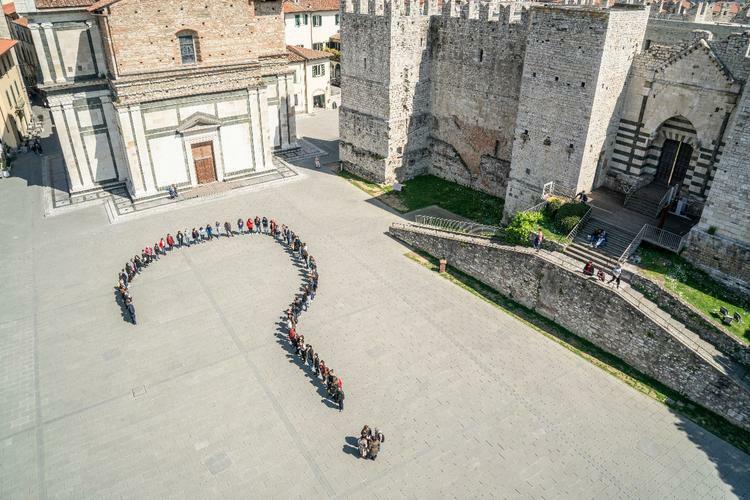 ), a photograph of a group of people arranged to form a large question mark in the Carceri square of Prato. 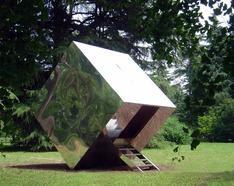 This is in fact the re-staging of Universal Futurological Question Mark [U.F.O. ], which Koller created in 1978, a photograph of a group of children in uniform forming a question mark on the side of a small hill. Tiravanija's remake contextualises Koller's work in a here and now that inevitably relates it to the present day which concerns us most, recalling the value of doubt and of asking questions about what is happening around us, but also inviting reflection on the relationship between the individual and the mass. Tiravanija's last work in Prato is Fear Eats the Soul, the large flag that waves in front of the museum entrance. Produced for the Creative Time Pledges of Allegiance project, which required artists to come up with a design for a flag in the spirit of political resistance, Tiravanija's work recalls the title of the film by Rainer W. Fassbinder Angst essen Seele auf, which tells of the difficult love story between a German cleaner and a Moroccan mechanic, a relationship that brings out their deepest fears as much as the xenophobia and racism surrounding them. The work can be considered a manifesto, a programmatic enunciation valid for all of Rirkrit Tiravanija's work, which is an act of faith in the meaning of human relationships, reception, closeness to the other, like values that give meaning to our life and our future.